From the author of the acclaimed A Case of Exploding Mangoes (“An insanely brilliant, satirical first novel . . . Belongs in a tradition that includes Catch-22”—The Washington Post), a subversively, often shockingly funny new novel set in steaming Karachi, about second chances, thwarted ambitions and love in the most unlikely places. The patients of the Sacred Heart Hospital for All Ailments need a miracle. Alice Bhatti may be just what they’re looking for. She’s the new junior nurse, but that’s the only ordinary thing about her. She’s just been released from the Borstal Jail for Women and Children. But more to the point, she’s the daughter of a part-time healer in the French Colony, Karachi’s infamous Christian slum, and it seems she has, unhappily, inherited his part-time gift. With a bit of begrudging but inspired improvisation, Alice begins to bring succor to the patients lining the hospital’s corridors and camped outside its gates. But all is not miraculous. Alice is a Christian in an Islamic world, ensnared in the red tape of hospital bureaucracy, trapped by the caste system, torn between her duty to her patients, her father and her husband—who is a former bodybuilding champion, now an apprentice to the nefarious “Gentleman’s Squad” of the Karachi police, and about to drag Alice into a situation so dangerous that perhaps not even a miracle will be able to save them. But, of course, Alice Bhatti is no ordinary young woman . 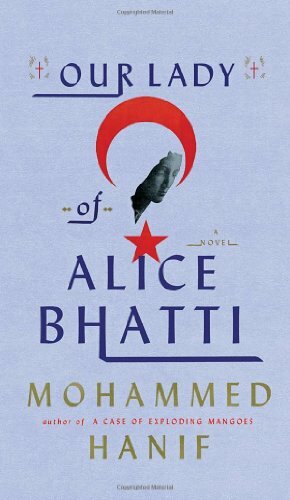 . .
At once a high comedy of errors and a searing illumination of the seemingly unchangeable role of women in Pakistan’s lower-caste society, Our Lady of Alice Bhatti is a resounding confirmation of Mohammed Hanif’s gifts of storytelling and of razor-sharp social satire.